About "Amplified Holy Bible Indexed Black (Black Letter Edition)"
You've trusted the Amplified® Bible to deliver enhanced understanding of all the rich nuances and shades of meaning of the original Bible languages. For this kind of in-depth study, no working knowledge of Greek or Hebrew is required-just a desire to know more about what God says in his Word. 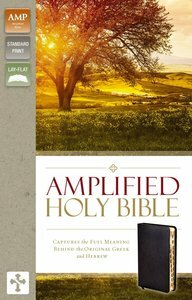 Now the updated edition of the Amplified Bible is even easier to read and better than ever to study and understand. It includes more amplification in the Old Testament and refined amplification in the New Testament. Additionally, the Bible text has been improved to read smoothly with or without amplifications, so that the text may be read either way. It's the same feel and style of study material that you love, now with even clearer wording for deeper understanding. Available in a portable size, the Amplified Holy Bible is perfect for your on-the-go lifestyle. Whether you're heading to class, church, a coffee shop, or a trip around the globe, the Amplified Holy Bible can travel with you.